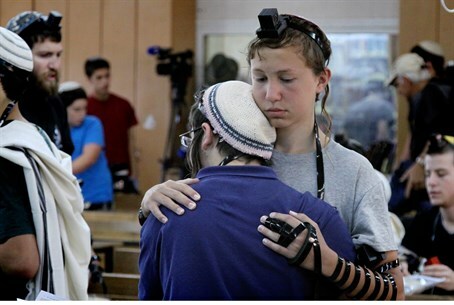 Hundreds of American Jews gather to pray for three Israeli teens kidnapped by Islamists. Around 200 Jewish Americans gathered outside the Israeli consulate in New York on Monday to pray for the release of three Israeli teenagers kidnapped in Gush Etzion, in the Judea region south of Jerusalem last week. The crowd, which included many children of school age, called for the safe release of the teens, of whom 16-year-old Naftali Frenkel has dual American-Israeli citizenship. They held up photographs of the missing youths with the slogan #BringBackOurBoys, copied from the social media campaign "BringBackOurGirls" launched for more than 200 schoolgirls abducted by Boko Haram Islamists in Nigeria two months ago. The slogan has been adopted by Israelis in solidarity with the three teens kidnapped by the Islamist terrorist group Hamas. Others held up placards accusing "Palestinian terrorists" of carrying out the kidnapping. Israel demanded Monday that Palestinian Authority head Mahmoud Abbas help in securing the release of the teenagers, and has carried out a vast search operation in Judea and Samaria, focusing on the Hevron region. Israeli Prime Minister Binyamin Netanyahu has said the youths were kidnapped by Hamas terrorists, and troops have rounded up 150 terror suspects since Friday, including scores of Hamas members and a number of leading figures in the Islamist movement.